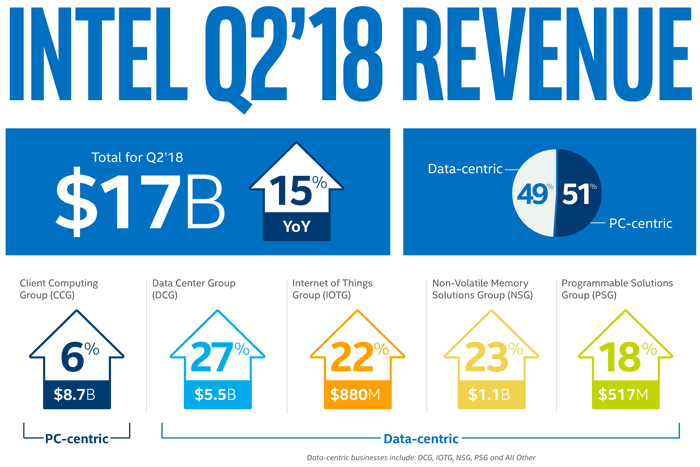 Intel has published its second-quarter 2018 earnings. If you look at Intel's news site and up-arrow strewn infographic, reproduced below, you would think everything is fabulous. Profits were up 15 per cent year on year at $17bn. 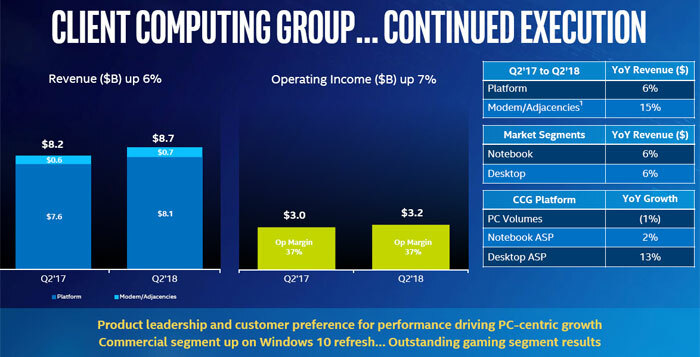 PC-centric revenues were up a decent 6 per cent, and data-centric revenues in all four segments of Intel's business enjoyed double digit percentage gains. Unfortunately, there is a 14nm sized fly in Intel's ointment. Bob Swan, Intel CFO and Interim CEO, welcomed the better than expected results and looked forward to Q3. "After five decades in tech, Intel is poised to deliver our third record year in a row. We are uniquely positioned to capitalize on the need to process, store and move data, which has never been more pervasive or more valuable," said Swan. "Intel is now competing for a $260 billion market opportunity, and our second quarter results show that we’re winning. As a result of the continued strength we are seeing across the business, we are raising our full year revenue and earnings outlook." The latest results are good, and the stated outlook is good - so what has hit the afterhours share valuation so badly? PC-centric business still accounts for the majority of Intel's revenues but Intel is having difficulties transitioning from its 14nm process. It has to keep tweaking architectures and refining 14nm as it delays 10nm mass production for some reason. Venkata (Murthy) Renduchintala, who runs Intel's Technology, Systems Architecture & Client Group attempted to address investor concerns about the 10nm volume production delay. Renduchintala reminded listeners that 14nm products have delivered in excess of 70 per cent performance gains since inception and could deliver continues gains with another tweak. 2 Has Samsung been chosen for Intel Xe GPU manufacturing? But shares fall after it says 10nm volume production will be delayed until H2 2019.
and in other news, intel still can't sort out 10nm so continues to f* around with 14nm just so they can prolong the boardroom sweepstake about how many motherboard chipset iterations they can get out of it. In the second-quarter results, Intel said that its 10-nanometer yields are “on track” with systems on the market in the second half of 2019. Krzanich's previous perspective wasn't specific on whether they would arrive in the first half of next year or in the second half. On the conference call with analysts on Thursday, Swan was more specific and said products would be on shelves in time for the holiday season. (in the US) the period of time from Thanksgiving until New Year, including such festivals as Christmas, Hanukkah, and Kwanzaa. That would mean November 2019,so say October to November next year as Thanksgiving 2019 is on the 28th of November. I wonder how long intel can continue to release less competetive chips, but still be at the heart of the lions share of the end products customers buy.